Pumphrey signed a reserve/future contract with the Eagles on Monday. Analysis: Pumphrey, a 2017 fourth-round pick of the Eagles, signed with Philadelphia's practice squad in October after spending his entire rookie season on injured reserve with a hamstring injury. He will have another opportunity to make final roster cuts in the leadup to the 2019 campaign. Pumphrey signed with Philadelphia's practice squad Tuesday. Analysis: The San Diego State product was originally cut from the Lions' practice squad Sept. 26, and found a new team Tuesday. The Eagles have been in the market for running back depth after they placed Jay Ajayi (knee) on injured reserve. Pumphrey has yet to make his NFL regular-season debut after a torn hamstring kept him on injured reserve throughout his rookie campaign. The Lions released Pumphrey from their practice squad Wednesday, Dave Birkett of the Detroit Free Press reports. Analysis: Pumphrey joined the Detroit organization after failing to win a roster spot with the Eagles at the conclusion of the preseason. The 2017 fourth-round pick has yet to make his NFL regular-season debut after a torn hamstring kept him on injured reserve throughout his rookie campaign. The Lions added Pumphrey to their practice squad Wednesday, Kyle Meinke of MLive.com reports. The Lions plan to add Pumphrey to their practice squad, Ian Rapoport of NFL Network reports. Analysis: Bringing Pumphrey aboard gives the Lions added depth behind Kerryon Johnson, LeGarrette Blount, Theo Riddick and Ameer Abdullah. At 5-foot-9, 176 pounds, Pumphrey isn't ideally suited for every-down work, but he can at least provide Detroit with an in-house change-of-pace alternative to Riddick. The Eagles released Pumphrey on Saturday, Zack Rosenblatt of NJ.com reports. Analysis: A fourth-round selection in 2017, Pumphrey was injury prone during his entire tenure with the Eagles and didn't appear in a single regular-season game. In reality, though, he had a tough path to a roster spot in a backfield composed of Jay Ajayi (undisclosed), Corey Clement, Darren Sproles and Wendell Smallwood. Pumphrey (hamstring) participated in Tuesday's practice, Zack Rosenblatt of NJ.com reports. Analysis: This coincides with the expectation that Pumphrey was going to be able to play in Thursday's preseason finale against the Jets. Pumphrey is still considered a long shot to make the Eagles' final roster, with the team boasting quality depth at running back already. 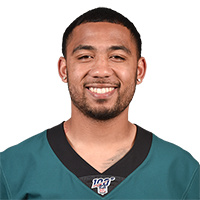 Pumphrey (hamstring) expects to see the field in Thursday's preseason game against the Jets, Dave Zangaro of NBC Sports Philadelphia reports. Analysis: Pumphrey also said that his hamstring "feels good" after being limited in yesterday's practice. The 2017 fourth-rounder spent last season on injured reserve following a dismal training camp, but he's bulked up since his rookie season. Even if Pumphrey can show well against the Jets, he isn't a lock to make the 53-man roster behind Jay Ajayi, Corey Clement and Darren Sproles. Pumphrey (hamstring) will practice in a limited fashion Sunday, Les Bowen of the Philadelphia Daily News reports. Analysis: Earlier in the week Pumphrey said he was "100 percent," but the doctors are still exercising caution. The 2017 fourth-round pick has yet to play in a preseason game, and even if he plays Thursday against the Jets, it won't be against the starters. Pumphrey's odds are slim to beat out Wendell Smallwood for the No. 4 RB position. Pumphrey (hamstring) is expected to return to practice this weekend, Reuben Frank of NBC Sports Philadelphia reports. Analysis: Pumphrey indicated he is back to "100 percent" health, but that remains to be seen. However, assuming an absence of setbacks, he plans on participating once practice resumes after this coming Thursday's exhibition against the Browns. The 23-year-old is competing against Wendell Smallwood and Josh Adams (foot) for a potential No. 4 running back role. Pumphrey relayed that the leg issue he's been dealing with throughout preseason is a re-injury of his hamstring, Martin Frank of The Delaware News Journal reports. Analysis: It's an alarming revelation since Pumphrey missed the 2017 season with a torn hamstring. The second-year pro still won't practice the rest of the week and will miss Thursday's preseason game against the Browns, but he hopes to play in the final exhibition contest. Pumphrey's competing against Wendell Smallwood and Josh Adams (foot) for the No. 4 RB gig. Pumphrey (leg) won't practice this week or play in Thursday's preseason game against the Browns, Chris McPherson of the Eagles' official site reports. Analysis: Pumphrey is battling for the No. 4 RB role in Philly, so missing the first three preseason games leaves him with little relevant game film to prove his worth. If he can return for the final exhibition contest against the Jets, it'll be against their reserve defense and leave much to the imagination. Pumphrey (lower body) is not expected to participate in Thursday's exhibition game against the Patriots, Les Bowen of Philly.com reports. Analysis: Pumphrey left Saturday's practice with a lower body injury and has been held out since. The severity of this issue is unknown at this time, but he is not expected to suit up for Week 2 of the preseason. With several running backs ahead of him on the depth chart, a quick return would be advantageous for his chances of earning a spot on the final roster. Pumphrey left Saturday's practice with a lower body injury and will not return, Jeff McLane of The Philadelphia Inquirer reports. Analysis: The specifics of Pumphrey's injury are yet to be released, so it's hard to say how severe it may be at this time. Pumphrey, who is competing for a depth role in the Eagles' backfield, was already held out of the team's first preseason game, and missing a second due to injury could severely hurt his chances of making the final roster. Pumphrey will not play in Thursday's preseason game against Pittsburgh, Jeff Skversky of ABC TV 6 in Philadelphia reports. Analysis: Pumphrey is likely competing with Wendell Smallwood, Matt Jones and Josh Adams for what may only be one final reserve running back roster spot. He's likely getting the game off and will show what he can do next week. Pumphrey has been targeted frequently in the early days of training camp and is making the most of his opportunities, Eliot Shorr-Parks of NJ.com reports. Pumphrey may end up competing with Wendell Smallwood and undrafted rookie Josh Adams for a single roster spot with the Eagles, Zack Rosenblatt of NJ.com reports. Pumphrey indicated he has fully recovered from his torn hamstring, Derek Togerson of NBC San Diego reports. "I'm 100 percent healed up and ready to attack next year," the running back said. "I know what's to come. I know the whole playbook in and out and by the time the offseason comes with OTAs and all that, I'll be ready to shine. You're going to see the versatile Donnel Pumphrey I once was and a stronger and faster back that can also do it on special teams." There are no videos available for DJ Pumphrey. Click here to view all videos.